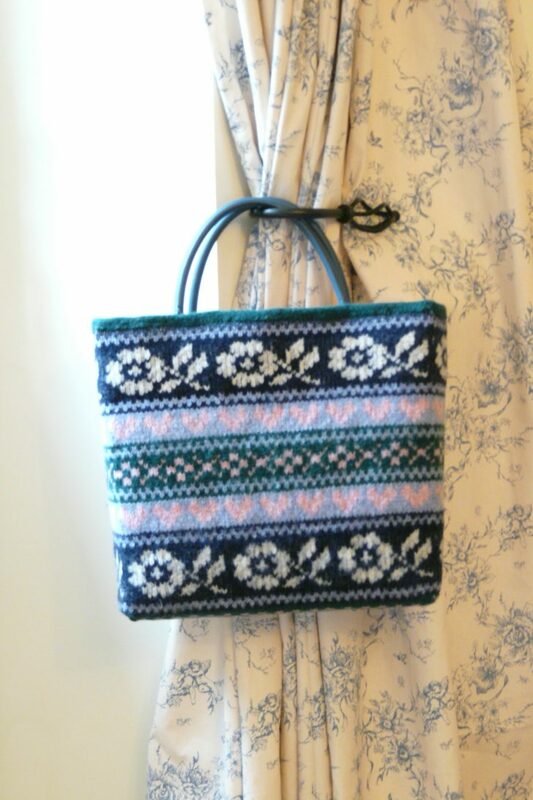 This fulled fair isle bag attracts admiring comments wherever it goes. The bag is mostly knitted in the round with stranded knitting technique. You will need a long (80cm/32″) 4mm/US 6 circular needle. The pattern includes written knitting instructions, colour-work charts, and instructions for fulling and lining the bag. Materials required are approximately 100g each of 5 colours of feltable aran/worsted-weight wool; half a yard each of lining fabric and iron-on interfacing; the equivalent area of plastic canvas (optional) for giving a rigid structure to the bag; and a pair of bag handles. The Fleur Tote pattern is also available in ‘Novel Knits’ (see ‘Books’).